This is the air pollution policy for Sriwittayapaknam School in Samut Prakan, Thailand. Other Thai schools are welcome to base their air pollution policies on our one. Our aim is to help all Thai youth. Our school has an onsite air quality station that continuously monitors the air we breathe, twenty-four hours a day. This is connected to the Internet so that parents and people in the local community can know more about the quality of the air both day and night. To see the AQI readings for our school, you need to download the AirVisual app. What is AQI and PM2.5? Air quality is acceptable; however, for some pollutants, there may be a moderate health concern for a very small number of people who are unusually sensitive to air pollution. Members of sensitive groups may experience health effects. The general public is not likely to be affected. Everyone may begin to experience health effects; members of sensitive groups may experience more serious health effects. Kindergarten students cannot learn P.E. outside. They will use the classroom instead. Other outside activities may be canceled as appropriate. Primary students cannot have any prolonged exertion outdoors for more than 30 minutes at a time. All Students: All outdoor P.E. lessons are moved to the classroom. Other outdoor activities must be cancelled. The students can go outside for a break, but they cannot run around or stay outside for more than 20 minutes at a time. Students with pre-existing conditions will be monitored. It is strongly advisable that this group wear N95 masks. All Students: P.E. lesson is cancelled for all students. All other outdoor activities must be done inside including assembly. The students can visit the canteen, but cannot run around the playground. In the classroom, windows and doors must be closed. Support Staff: Everyone should wear a N95 mask if working outside. All outdoor activities must be cancelled. 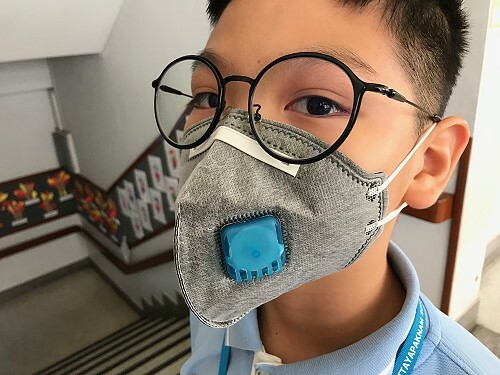 All teachers, students and support staff must wear N95 masks.